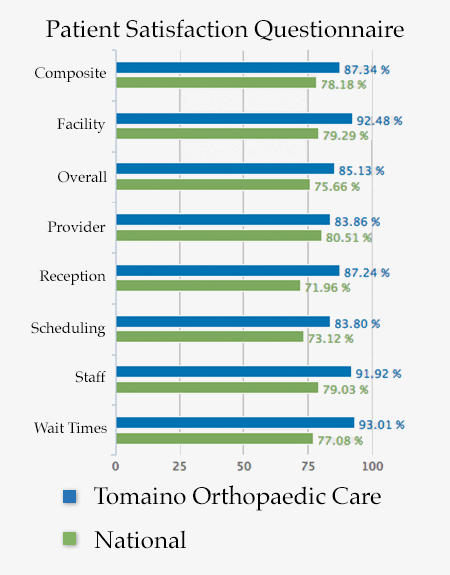 Since beginning to rigorously solicit feedback since April of 2012, Dr Tomaino has exceeded national benchmarks for patient satisfaction in these categories. This graph shows the percentage of "5's" (with a 5 being perfect) given to us compared to the national average. We don't view reviews as either right or wrong but, rather, always absolutely valid. We feel that reviews are about how you felt about your interaction with us so we want to know. If you'd like to give us a review after your visit with me'we would appreciate it. Please take this opportunity to help us continue to develop so that we may provide the best care for you. If you would like to see what other patients feel about their experience with us, read the reviews below. Dr. Tomaino is an amazing doctor that cares about his patients and recommends the correct treatment or surgery. I highly recommend Dr. Tomanio for upper extremity needs! Dr. Tomaino and his entire staff have been wonderful in helping me recover from a shoulder injury. When the injury first happened, I was able to schedule an appointment for the day after I called. Dr. Tomaino answered all my questions and began treatment immediately. After trying more conservative treatment, I ended up having surgery. Again, he and his staff were happy to answer my questions and help me feel comfortable throughout the process. He will certainly be the first person I contact if I have any arm/shoulder issues in the future! I can't say enough good about this doctor and his staff. After my first visit I emailed him regarding a concern I had, and I was amazed he responded very quickly. He saw my email while in the middle of a busy schedule, and quickly left me a voice message to connect and relieve my immediate concerns, then I could follow up if I had more questions. I have only been there twice, my surgery is not scheduled yet, but I am positive and look forward to him doing the surgery. I have confidence and trust in him and his staff. His staff is another very big plus. I initially went to his office after having a "not so pleasant" experience with the staff at another orthopedic's office, so much that after a few connections with them, I did not want to go there. I got a referral for Dr. Tomaino's office, and I have been very pleased that I switched to them. The staff is knowledgeable, professional, kind, helpful, and efficient. The office also is a beautiful office! Thanks for all you do and your caring, Dr. Tomaino, and staff! Dr. Tomaino has operated on me twice in the past 10 years, having both elbows operated on. Dr. Tomaino and his staff always provide top notch care. Dr. Tomaino and his entire staff are extremely compassionate and always willing to help and answer all questions. Lisa has been exceptional in helping me with getting my paperwork fro disability completed and faxed over in a timely manner. Dr. Tomaino and NP Amy both awesome bed side manors and really made me feel at ease before, during and after my surgeries. I highly reccomend Dr. Tomaino for orthopedic treatment for anything he specializes in. Nothing. The office is beautiful and immaculate. All the staff were very professional and friendly. Dr. Tomaino was warm and welcoming. He really took time to help me and did not rush the process like others have before. You cannot improve on perfection so since you all are perfect I would not change a thing. I can't think of anything. You run a very efficient office! Send me home with MRI photos and show what will be done to correct the problem. Move closer to Binghamton! No, had no issues! My experience was one of the best I ever experienced medically and I would not change a thing. Can't think of anything. Provide free coffee? lol But there wouldn't be time to drink it because I never have to wait long for my appointment! absolutely nothing. you all were great. thank you so much . it was great meeting you all. i would highly recommend you. i am feeling better. I really would have to struggle to find something that your office could improve upon. My experience at Dr. Tomaino's office was very professional and courteous. Very nice job. My thanks and appreciation. You have a very efficient office staff, and that is half the battle. I can not come up with one suggestion. there is not one thing I would change.